My kids love Greek food. One of their favorites is a dish in Cyma called Kotopoulos Lemonato, a kind of greek chicken adobo. I experimented on the flavors and came out with this dish. I like that it’s simple and gluten free at the same time. Marinate chicken in lemon, oregano, pepper, garlic and olive oil and salt for around 3 to 4 hours in a round pyrex dish. 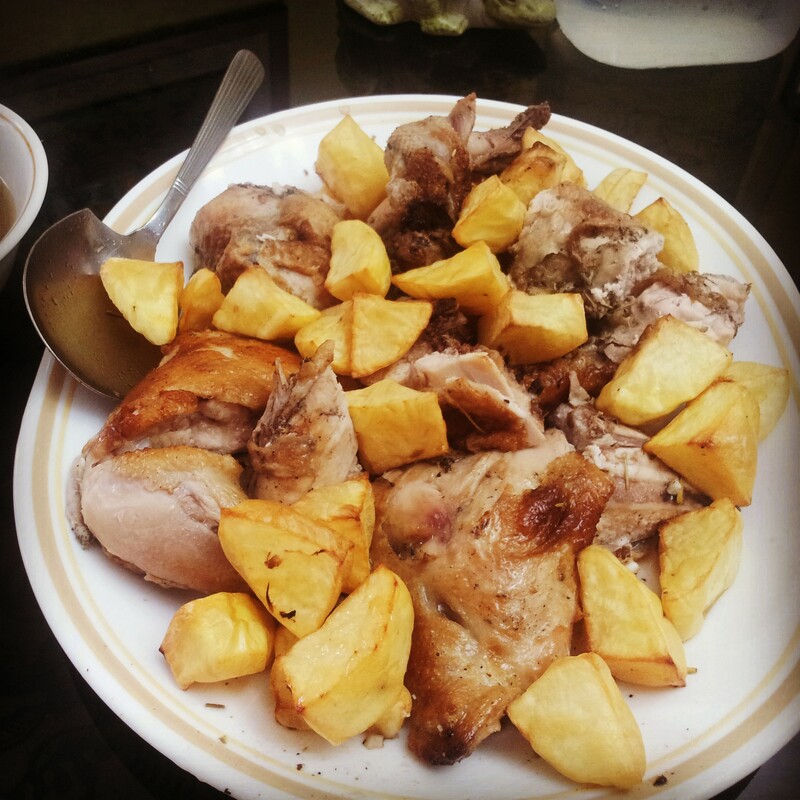 Place potatoes around the chicken. Put the pyrex dish in the turbo broiler. Roast in turbo broiler or oven for around 45 minutes to 1 hour at 350 F.
Brush the chicken skin with the marinade after 30 minutes. Brush again 15 minutes after. Did you know that raw unfiltered apple cider has anti-bacterial, anti-fungal, and anti-viral properties? As far as 400 B.C. 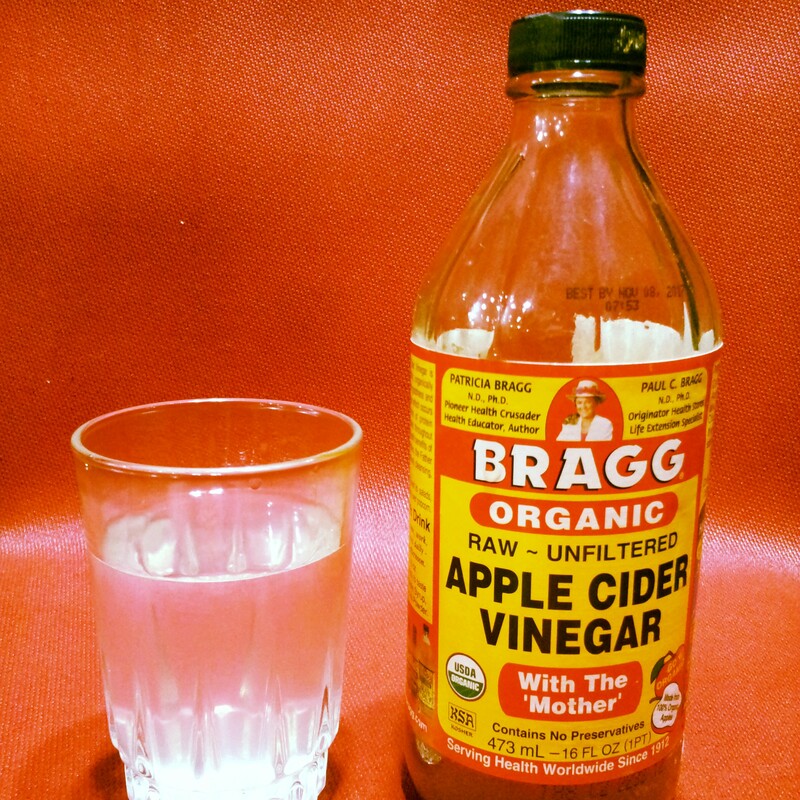 Hippocrates the father of modern medicine knew about apple cider vinegar’s antibiotic properties and recommended it to his patients for its’ healing properties. I tried gargling with a mixture of apple cider and mineral water today to help with a cough, a sore throat and a slightly inflamed right ear. It actually helped. I felt relief after 15 to 20 minutes, but you have to gargle several times in a day to make it work. Germs have difficulty surviving in an acidic environment created by the vinegar. It also helps to take other medication prescribed by your doctor as well. I’d suggest gargling 3 to 4 times a day. NOTE: Always dilute apple cider. Apple cider is very acidic and can burn tissues in the mouth. My kids like McDonald’s chicken nuggets a lot. I don’t really let them eat them often because they’re processed and chock-full of chemicals. 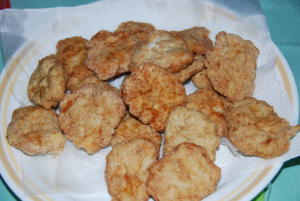 This shares with you our homemade version of chicken nuggets. Mix chicken, pork backfat, salt, pepper, oregano, parsely flakes, paprika, 1 organic egg together. Line a container with wax paper . Roll chicken nugget mixture into mini patties and freeze. Before cooking, brush patties with egg and roll in rice flour. Dip again and roll in breadcrumbs if desired. Fry. (make sure that the oil is hot , before frying and don’t overcrowd the pan). Mix all ingredients together and marinate for 1 to 2 hours. Mix rice flour and cornstarch together. Heat oil in a wok. 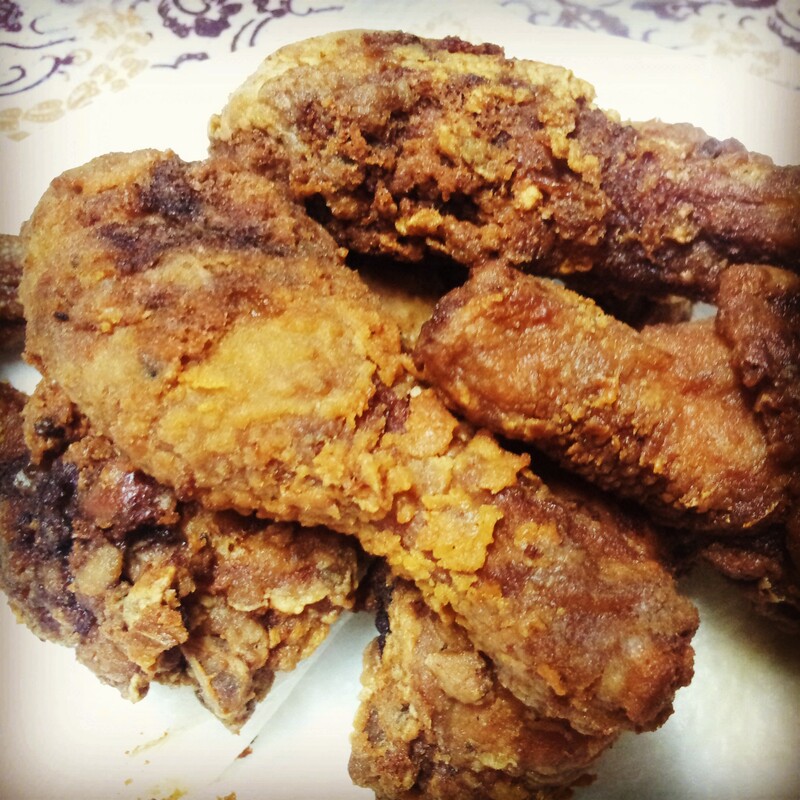 Put enough oil to fry drumsticks in. Dredge drumsticks in flour. Please make sure not to overcrowd the pan. Fry for 10 to 12 minutes. Drain chicken on paper towels before serving. Notes : These chickens are tasty even when they’re cold. Colds and cough can be irritating. One of the best ways to help reduce common symptoms of a cold is to gargle with salt water. I often gargle with salt solution whenever my throat feels irritated. According to Dr. Philip Hagen editor in chief of MAYO CLINIC Book for Home Remedies, “ a saline solution can not only draw excess fluid from inflamed tissues in the mouth.” Dr. Hagen further points out that “ gargling also loosens loose mucus, which can remove irritants like allergens, bacteria, and fungi from the throat. A randomized study in the American Journal of Preventive Medicine in 2005, showed 400 volunteers who were observed for 60 days during the colds and flu season. Some of the subjects were actually told to gargle salt solution for 3 times day. Interestingly, the group who gargled regularly had a 40% decrease in upper respiratory tract infections compared to the control group. There have been other studies that found that gargling was helpful versus sore throats and congestion. 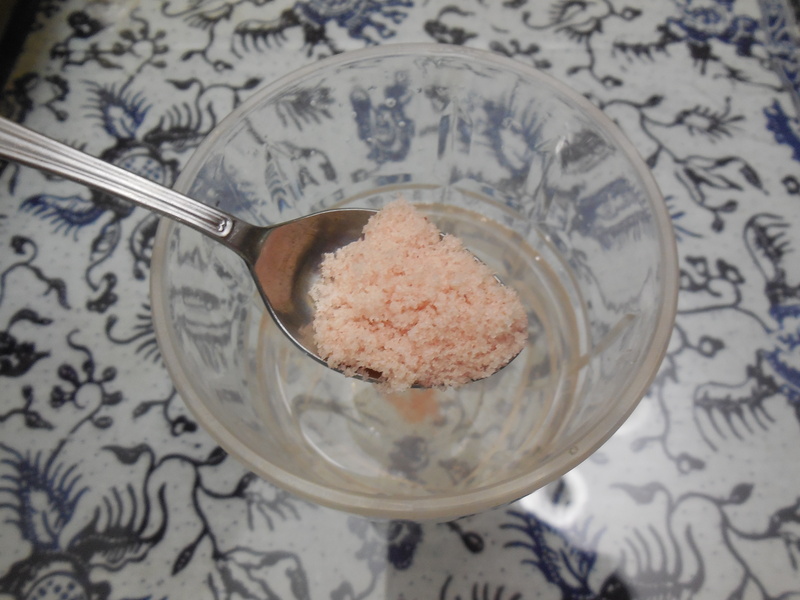 1 /2 to 1 teaspoon of rock salt ( or Himalayan pink salt). Mix until the rock crystals are melted. Gargle solution and spit out after a few seconds. Recommendations: Gargle regularly for best results. Drinking homemade ginger tea with honey can help alleviate symptoms of congestion which is a symptom of the common cold. It can also relieve the feeling of an itchy throat. What many of us don’t know is that ginger can actual help boost your immune system, it can also keep you warm during a cold day. It also helps promote healthy sweating which is helpful during colds and flu. Sweat may do simply more than aiding in detoxification, German researchers recently found that sweat contains a germ fighting agent that may help fight infections. According to Dr. James Steckelberg M.D. , honey is an effective cough suppressant. In a study done on children ages 2 and up with respiratory tract infections, they were given 2 teaspoons of honey at bedtime. 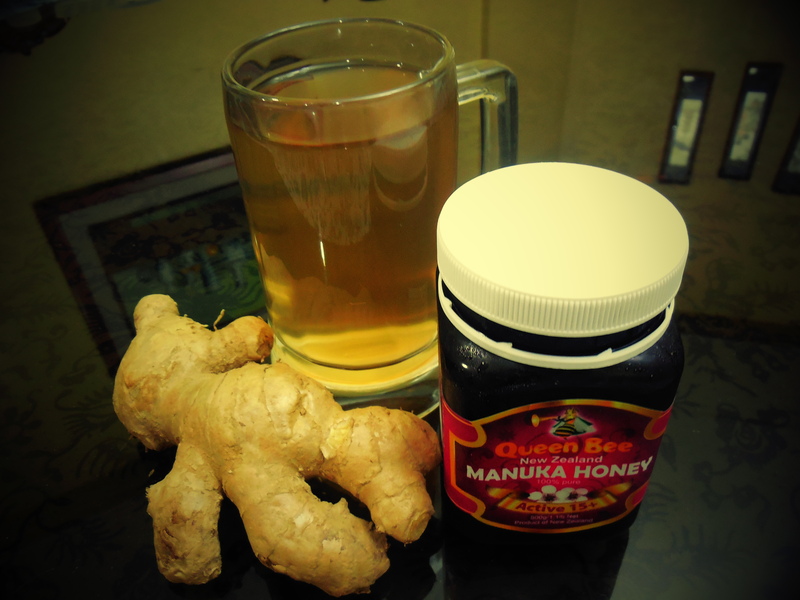 The honey seemed to reduce night time coughing and improve sleep. In the study, honey seemed to be as effective as a common cough ingredient dextromethorphan in typical low doses. Remove the skin from the ginger. Crush the ginger with the flat side of a knife. Add to 5 cups of water . Boil until the water changes color. Allow to cool. Estimated time 10 minutes. Add 2 tsp of honey for every glass of ginger tea. Makes 4 cups of ginger tea. Suggestion: Have the child drink the ginger honey tea prior to bedtime. Warning: Never give honey to a child 1 year or younger due to the risk of infant botulism. Watermelons are a childhood favourite of mine. 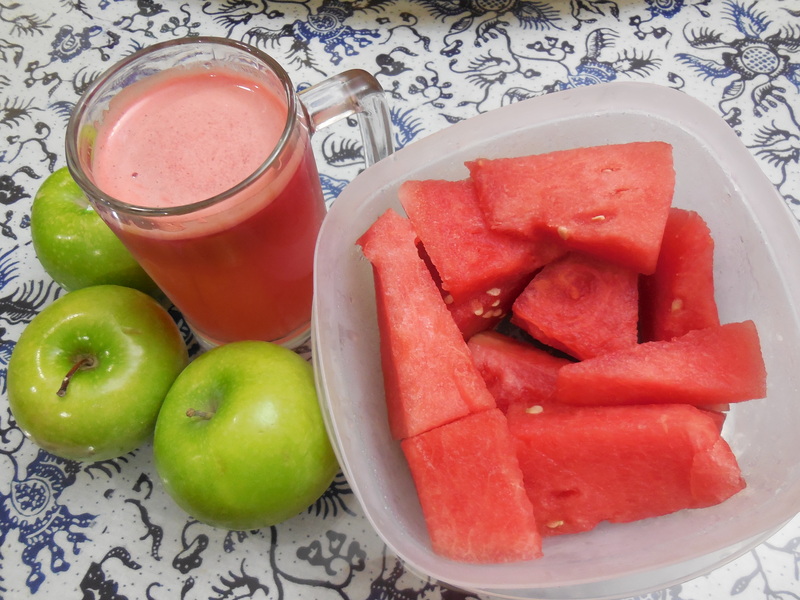 I tried mixing watermelons and green apples today to balance out the sweetness . 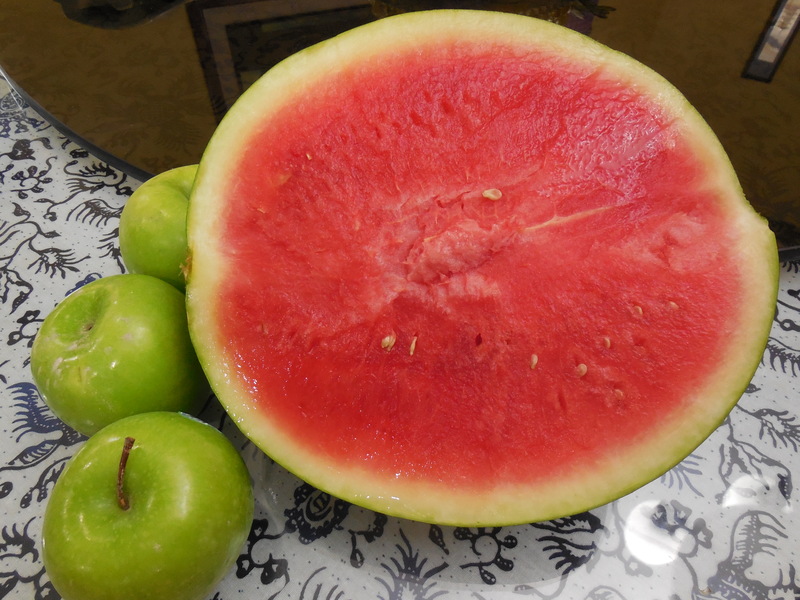 Ripe watermelons are a wonderful source of lycopene. The lycopene levels of watermelons store well even up to 7 days in well refrigerated conditions. Lycopene is a well known oxidant with the ability to neutralize free radical molecules. It also contains a good amount of Vitamin C and vitamin A. It also contains potassium and magnesium. Apples are a good source of polyphenols which function as antioxidants. Most of the nutrients of the apples are actually concentrated on the skin. When buying non-organic apples, one must be sure to wash the apple thoroughly while brushing with a bristle brush to get rid of the wax on the apple. This is a refreshingly cool drink and none too sweet. Suggestions: Drink within 30 minutes of juicing to retain freshness.